The edit box indicates the default language code page. The default language code page is used for sessions that have not explicitly specified a code page file (Setup, Sessions..., Host, Code Page). Click the Browse... button to display the Code Page Setup dialog box. To specify a new default language code page from the Code Page Setup dialog box,.select a code page from the drop-down list box or click the Browse button to choose an *.cpg file. The edit box contains the folder location of the TN3270 Plus configuration files. See Moving the TN3270 Plus Configuration Files for instructions about moving the configuration files to a new folder. Check this box to display the Connect to Host dialog each time TN3270 Plus is started. If TN3270 Plus is configured to start sessions automatically, you may choose not to display the Connect to Host dialog when TN3270 Plus is started. Check this box to terminate TN3270 Plus when the last session is closed. If this box is not checked, TN3270 Plus will remain active and display the splash screen after the last session is closed. TN3270 Plus will terminate while sessions are active. Check this box to display an information dialog box when the host computer closes a session. Check this box to display a confirmation dialog box when you try to close a session (Host, Close). Check this box to display the Full Screen Mode confirmation dialog box when you switch to full screen mode. By default, Full Screen Mode removes the window frame, toolbar and status bar and adds the Operator Information Area (OIA). Check this box to use your session settings rather than the default Full Screen Mode settings. By default, Full Screen Mode removes the menu bar from the display. Check this box to display the menu bar in Full Screen Mode. Check this box to keep the application window visible even when another application has the focus. Warning: If this option is set when in Full Screen Mode then no other application windows are accessible until full screen mode is ended. Check this item to start new sessions in their own windows. When this option is checked, a new window is created for each session. When this option is checked, it takes precedence over the session option (Setup, Sessions…, Setup Items = Host, Start in a new window). If this option is not checked, the session option determines whether or not a new window is created. Check this item to eliminate session tabs from the TN3270 Plus window. When this option is checked session tabs never appear. When this option is not checked, session tabs appear when you connect more than one session in a window. TN3270 Plus must be restarted for this option to take effect. See Working with Multiple Sessions for more information about connecting multiple sessions. Check this item to move the session tabs above the TN3270 Plus terminal window. 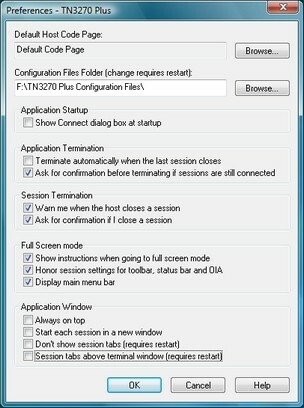 When this option is not checked, session tabs appear below the TN3270 Plus terminal window. TN3270 Plus must be restarted for this option to take effect. See Working with Multiple Sessions for more information about connecting multiple sessions.